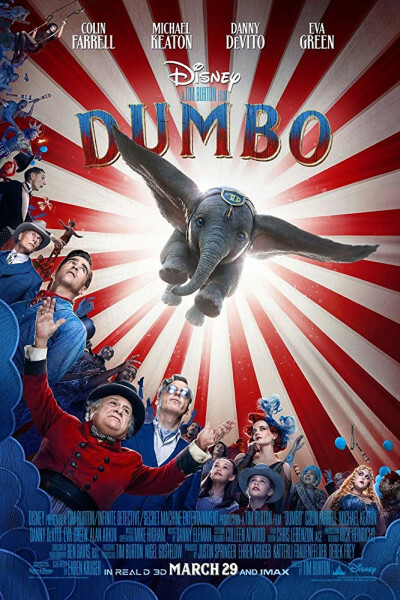 There are several ways to screw up a film, and Tim Burton's Dumbo seems to have found all of them, save one adorable star. We've got bad casting, poor acting, 80% doom/gloom, 10% trepidation, and 10% jubilation, when what we really needed was 10% anticipation and 90% jubilation. It is, after all, a family film about outcasts finding their way. Alas, I was nervous for poor l'il Dumbo for the better part of two hours, and I don't think that's how family films should make us feel. But man oh man, what an adorable little guy! Aside from the ears, he's all forehead, eyelashes, and doe-eyes set upon a body with the proportions of a snowman.